Last year, their jokes were admittedly awful. "It's all uphill from here," the Nixon Rodeo told passing Bloomsday runners from the base of Doomsday Hill. 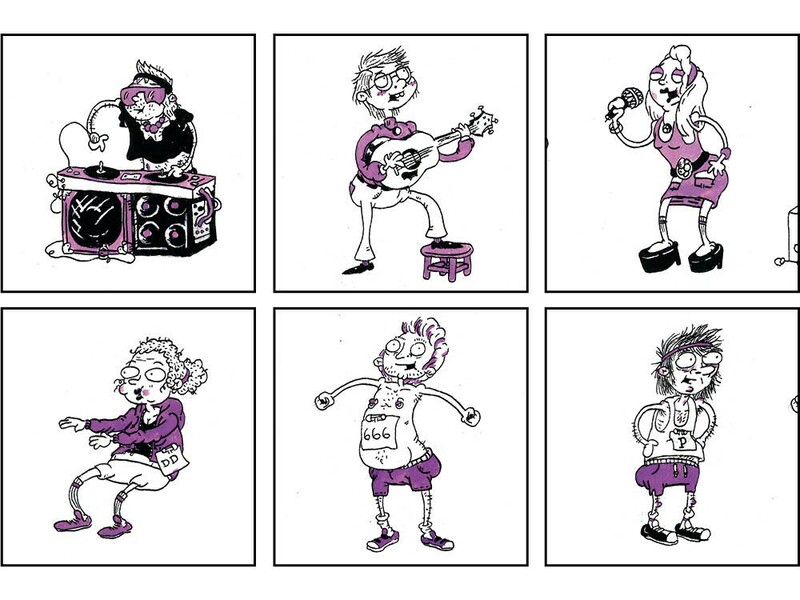 Thanks to wireless guitar packs, the hard rock musicians could trot alongside athletes for a few paces, serving up high-fives and an extra boost of confidence. Like the other bands on the course, they wore themselves out for four hours straight. Their efforts lead to a second-place finish in the Best Bloomsday Entertainer contest, voted on by runners. Back for their second year, bassist Travis Singleton says his band, with a penchant for skinny jeans and flat-bill hats, wouldn't miss the opportunity to play their spirited originals and covers again. "People found us afterward and said we were the push they needed to get up the hill," Singleton says. A member of previous bands, Singleton is a Bloomsday veteran playing his seventh this weekend. Last year, he told Nixon Rodeo drummer Ethan Harrison to avoid serious blisters by wrapping his hands in athletic tape. "I didn't know that the first year I played and I was bleeding everywhere," says Singleton, a former drummer. In the same way, lead singer Brent Forsyth also was concerned that his powerful screaming/singing voice wouldn't hold up for the race's duration, but with the help of tea and water he managed fine. Sunday, the four-piece will rise at 6 am, pack their gear in Milhous (a "cherry condition" '85 GMC Vandura named after President Nixon's middle name), down a breakfast of Monster Energy drinks and McGriddles and hustle over to the same Doomsday space. Laurel Warner, a Bloomsday entertainment committee member, also will be up early, making sure the 29 on-course bands are in position to entertain by the 9 am start. Bands have been lining the roads of Bloomsday almost since its inception, but weren't regulated until 2004, says Warner. Since then, many bands have come back for more, opting to play in the same space many years in a row. For most, this is the only time they'll play to a crowd of 50,000. A runner herself, Warner has participated in Bloomsday for 30 years, except the one year she was seven months pregnant and her doctor wouldn't allow it. "I am a runner who prefers to run with music," explains Warner, who is running again this year. "I have friends who can't stand the idea of running with music, but it absolutely motivates me. I know it motivates a lot of other people, too." Warner is proud of the way organizers have incorporated local musical acts of all genres over the years, from Christian metal bands to Frank Sinatra tribute soloists. Upright bass player Wayne Meredith is 75 and has participated in Bloomsday for a decade with his accordion-playing wife, Marian, and their band Good Ole Stuff. There are some things Meredith still isn't quite prepared for. His band isn't equipped with all of that fancy rain-preparedness equipment other groups, including the Nixon Rodeo, have. "If it rains, you dang betcha I'd stop playing — you don't take a bass fiddle and get it wet," Meredith says. But in all of his years playing Bloomsday, it hasn't rained once. "This might be the last year, because it's an extremely tough job playing for three hours nonstop," says Meredith, who plays a shorter set in a spot (on Riverside past the Marne Bridge) closer to the start of the course. He's threatened to quit before and still comes back every year. Even though it can be tiresome, there is one memory keeping Meredith in the race. A few years back after every other racer had passed and his band was relaxing, two women approached wondering if they'd play for one more participant. "I don't know who this young woman was, but she was on crutches and every step was labored," Meredith says. They played the songs they knew best, standards from the 1880s to the 1950s, until the woman was out of sight. 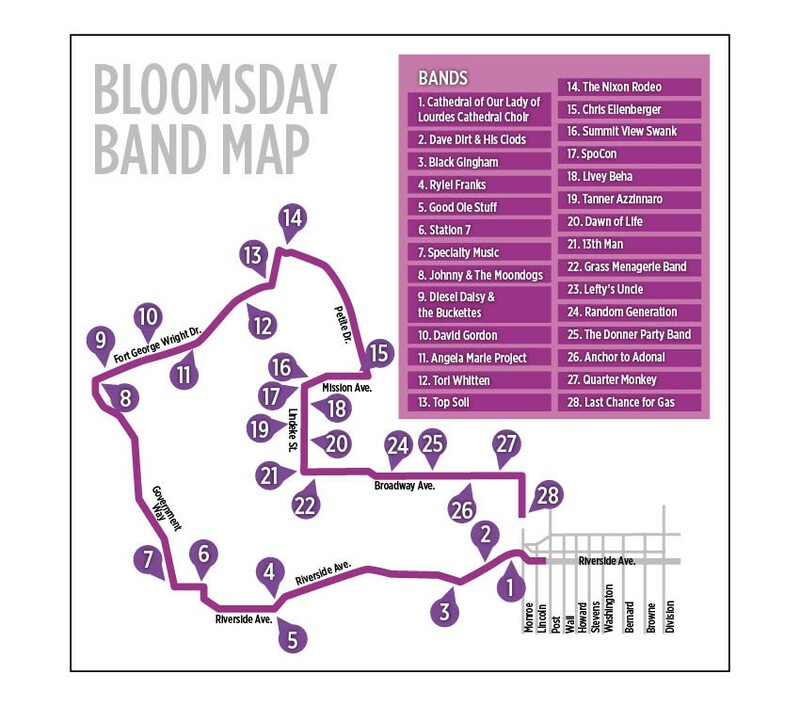 Remember to vote for your favorite on-course band afterward, at bloomsdayrun.org, to help them win the Best Bloomsday Entertainer award.